He was born Albert Finney Jr., and studied at the Royal Academy of Dramatic Art, graduating at age 20 in 1956. He became a member of the Royal Shakespeare Company shortly thereafter, and appeared on the stage throughout the late 1950s, and throughout his career. His debut film role was “The Entertainer” in 1960. He was the title character in the Oscar Best Picture “Tom Jones” (1963), and other films in that decade included “Night Must Fall” (1964), “Two for the Road” (1967) and “Charlie Bubbles” (1968, also directed). His most fruitful film era was arguably the 1980s and ‘90s, but he did portray “Scrooge” (1970) in the musical version of “A Christmas Carol” and detective Hercule Poirot in “Murder on the Orient Express” (1974), followed expansively by “Wolfen” (1981), “The Dresser” (1983), “Under the Volcano” (1984), “Miller’s Crossing” (1990), “A Man of No Importance” (1994) and “Breakfast of Champions” (1999). Post the millennium, he was Julia Robert’s boss in “Erin Brockovich” (2000), was in two “Bourne” films (“Ultimatum” in 2007 and “Legacy” in 2012) and in the James Bond film “Skyfall,” also in 2012. Way back in college, I discovered this hidden gem, and was immediately enamored by its structure and non-linear narrative. 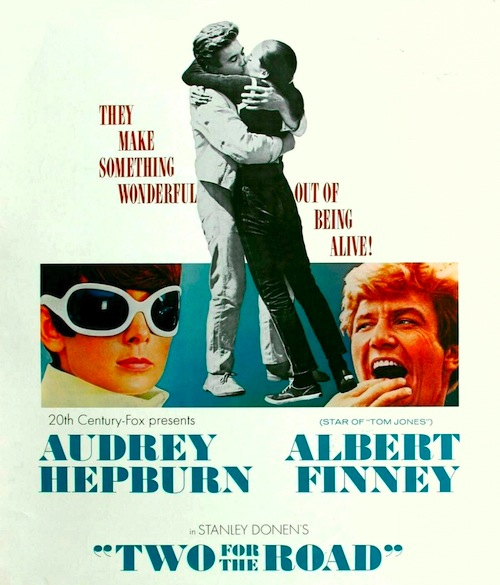 Directed by Stanley Donen (who himself passed away February 21st, 2019), it features Albert Finney and Audrey Hepburn as a married couple who analyze their relationship when they realize they’re traveling on a familiar road trip landscape. Full of flashbacks and well-versed experiences, especially for any couple who has been married or together for a long time, it was most likely my introduction to Albert Finney and his blunt style of characterization. Plus, like “Breakfast at Tiffany’s,” composer Henry Mancini wrote the theme for the film. Finney and Hepburn have appropriate chemistry for such a story, and it was interesting at the time to experience AH beyond her coquettish early roles. As I grow older, the truths in this film become more self evident. Yikes. FINNEY FLOURISH: Again, flashing back to my first experience with the film, the bickering of the couple was uncomfortable and foreign to my nature, especially through the directness of Albert Finney. Funny how things change when a film is viewed through another place and time. Yes, funny. 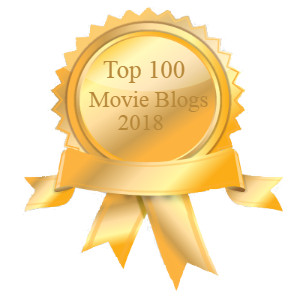 If modern audiences are familiar with Agatha Christie’s famous Belgian detective Hercule Poirot at all, it’s likely through David Suchet’s dapper TV version, or possibly the impressive mustache of Kenneth Branaugh’s recent big screen adaptation. 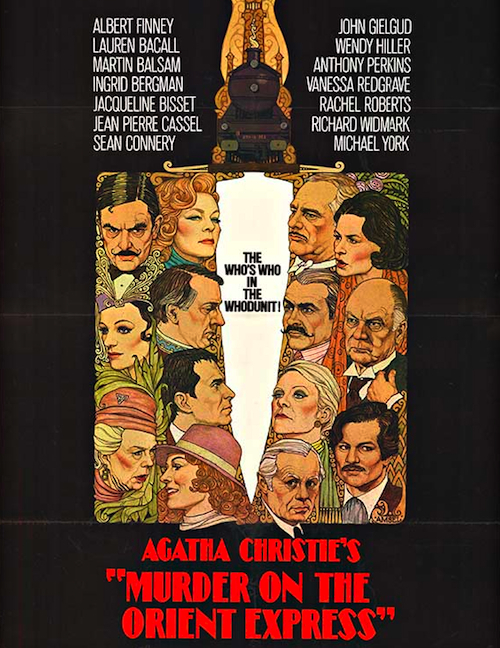 But Albert Finney offered his own one-off portrayal in this 1970’s star studded epic “Murder On The Orient Express,” and earned one of his four Oscar nominations. He manages to make the Belgian sleuth more than just the sum of his many quirks, while thoroughly disappearing inside the character … so much so that Finney himself felt his Poirot was too much of a good thing, in that he felt typecast for years afterwards. However, Finney didn’t treat it as a star turn, instead focusing on creating an entertaining member of an extraordinary ensemble, whose mind was always working to make the scene better even when he wasn’t in the spotlight. FINNEY FLOURISH: Author Agatha Christie said this was one of the only adaptations of her books she actually liked, although she took issue with Finney’s mustache, which she felt was insufficiently grand. I think she has a point. Albert Finney had a long, robust career being in films … from Agatha Christie stories to Tim Burton tales. 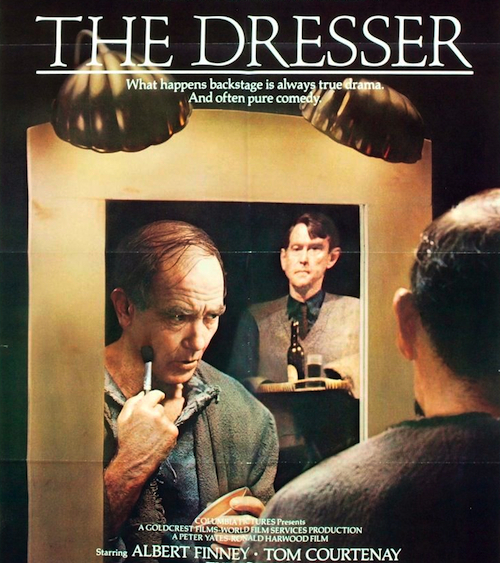 While the earlier generations may be more familiar with the former, and the newer generation can more easily recall the latter, there is a true gem hidden in between – the film “The Dresser.” Inside this single work, Finney’s accumulated acting experience is in full display. There is a bit of every character he has ever played and would ever play, beyond the cantankerous old man that we know him to play oh-so-well. The role was so fantastic that it earned him one of his five Oscar nominations for acting, and it’s what I would easily consider Albert Finney’s magnum opus. He had many magnificent roles after this one, especially in some iconic franchises, but “The Dresser” is the film that will always stand out when I remember this monumental man. FINNEY FLOURISH: You are able to see the full scope of Finney’s performance ability as his characters in the film switch from several emotional extremes at the drop of a hat, all while delivering a powerful performance-within-a-performance, and still he managed to lace it all with hints of humor (aside from a few scenes with black face that haven’t aged very well). Source material for this article is from Wikipedia. 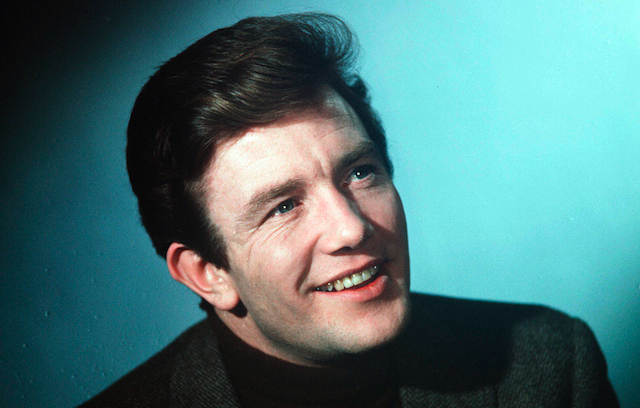 Albert Finney, 1936-2018.